Landscape archaeology has introduced a major shift in archaeological thinking, from artefact driven and site-based research towards a more holistic understanding of the engagement of (pre)-historic dwellers within their cultural, social and economic landscape. As a basic requirement, archaeologists need to acquire knowledge about the physical and cultural layers of their area under study. Here, the rapid development of non-invasive techniques of archaeological prospection can provide detailed and large-scaled insights into existing archaeological and palaeo-environmental structures. 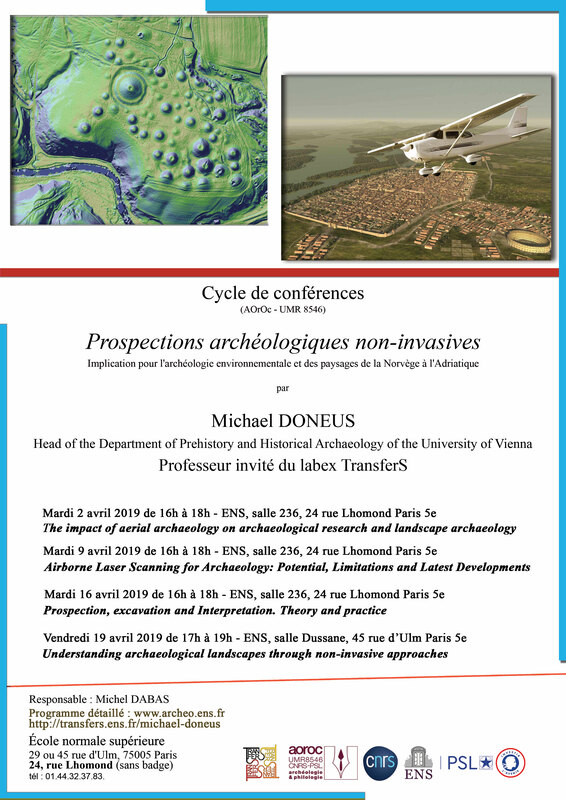 The first lecture will give a short overview of archaeological prospection and then focus specifically on aerial archaeology, one of the oldest and most successful archaeological prospection techniques. After introducing the basic principles of remote sensing and the formation of ‘visibility marks’, the workflow of aerial archaeology (including data acquisition, data storage, rectification and archaeological interpretation) will be explained. An emphasis will be placed on current developments (automated rectification of images, hyperspectral imaging) in aerial archaeology, its significance within archaeological research, its relationship with geophysical approaches and its impact on landscape archaeology. Almost one and a half decades after its first mention in archaeology, Airborne Laser Scanning (ALS) has turned out to be an extremely useful prospection technique in many environments. Its potential to measure dense, precise and accurate digital surface (DSM) and digital terrain models (DTM) is of relevance for a wide range of archaeological applications. Today we can state that, regardless of whether ALS is used in open fields or forested and otherwise densely vegetated areas, it has the potential to assist in three main aspects of cultural heritage protection : detection, documentation, and monitoring of sites, monuments and landscapes. However, experience shows that ALS is often used as a ‘Black Box’, where the derived DTM and its visualizations are used without further knowledge about underlying technology and metadata. Therefore, there is a possibility that such datasets are not understood and will therefore not be suitable for a specific archaeological application. During this lecture, the full workflow for successful use of ALS data in archaeological research will be explained, starting with choosing the right equipment for data acquisition, geo-referencing, filtering, and DTM-generation to visualizing and interpreting the results. In addition, the presentation will provide an overview of the state of the art and will specifically deal with recent developments such as Airborne Laser Bathymetry, multi-wavelength scanning and radiometric aspects of ALS data. Archaeological methodology is currently in the midst of a massive transformation. For the past century, archaeology has been mainly associated with digging, and excavation was seen as the primary archaeological information source. Today, this view is being challenged by the rapid development and application of a broad spectrum of non-invasive approaches, including airborne remote sensing and geophysical prospection techniques such as magnetometery and ground penetrating radar. In particular, the widespread use of an integrated array of large scaled archaeological prospection techniques has shifted the focus from an artefact-based interest in single sites to a completely new view that allows for a more comprehensive understanding of cultural landscapes. We collectively term these approaches ‘archaeological prospection’. This lecture will investigate the relationship between archaeological prospection and excavation. A specific focus will be on the archaeologist’s attitude towards non-invasive approaches and that we need a new way of thinking about the relationship between excavation, prospection and archaeological interpretation. In the final lecture, the focus will be on landscape archaeology and the role of integrated archaeological prospection. The term « landscape » comprises both physical space as well as its cognitive equivalent, with the latter referring to the concept of its dwellers. Landscape archaeology has to cope with both of these aspects of landscape. An interpretation of its meaning must be sought based on the description of its physical remains in form of archaeological and palaeo-environmental objects and structures. It seems, however, that a divide still exists between technical and interpretative approaches when investigating archaeological landscapes.